In April 1990, Joaquim Chissano paid a four-day visit to Portugal to discuss trade and economic relations between the two countries, and, more significantly, the possible future role of the former colonial power in mediating the peace process. Chissano’s position was clear: we are revising the constitution, the South Africans have legalised the liberation movements, there is simply no further need for any more fighting. Portugal, however, although it was willing to help did not want to mediate per se; and in any case, Afonso Dhlakama of the MNR was upset with the Portuguese at the time. 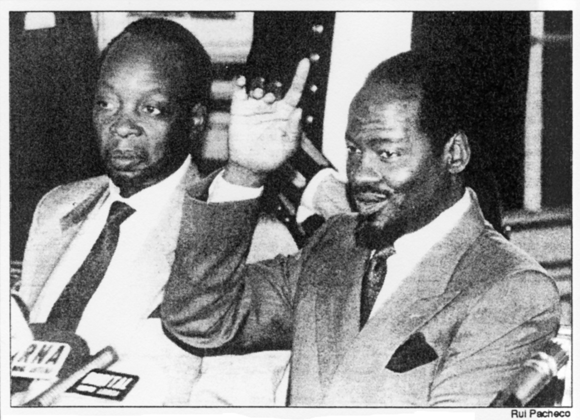 Above: Prime Minister Pascoal Mocumbi (left) and President Joaquim Chissano (right) during their visit to Portugal in April 1990 to discuss the possible role of Portugal in mediating the peace process between the Mozambican government and the armed rebels of Renamo. In May, it was reported that the press secretary of the Mozambican embassy in Lisbon, a certain Guilherme Simão Tamela, had shaken hands with Sebastião Temporáario of Renamo at some kind of social event. Although the handshake may have been accidental, and neither of the envolvidos was exactly uma figura, the incident had a certain minor symbolic impact at the time – and it was photographed (see below). There will be an estimated 46 or 47 pages on the MHN website dedicated to the peace process, from 1984 up to November 1992. They are ordered chronologically. Click on the green button below to jump directly to the page covering the period that you are interested in. Note: at present only pages 1-12 are available, that is, up to January 1990. New pages will be posted regularly in the coming weeks. Colleen Lowe Morna. Hopes and fears. New African [London] (April 1990), p.18. In English. Click here to download a PDF file, size 203 kb. Chissano debate a paz em Lisboa. Diário de Lisboa [Lisbon] (9 April 1990). In Portuguese. Click here to download a PDF file, size 21 kb. President Joaquim Chissano begins a four-day visit to Portugal. Joaquim Chissano diz não haver já razão para a Renamo continuar a desestabilizar. Século de Joanesburgo [Johannesburg] (9 April 1990). In Portuguese. Click here to download a PDF file, size 43 kb. A par das relações económicas entre os dois países, Chissano discute em Portugal questão da paz em Moçambique. Diário de Notícias [Lisbon] (9 April 1990). In Portuguese. Click here to download a PDF file, size 100 kb. Reports that the two key agenda items for the visit will be economic relations between Mozambique and Portugal, and Portugal’s possible role in the ongoing peace process. Portugueses constituem lobby para a democracia em Moçambique. Século de Joanesburgo [Johannesburg] (9 April 1990). In Portuguese. Click here to download a PDF file, size 543 kb. Chissano to brief Portuguese leaders on peace moves. Herald [Harare] (10 April 1990). In English. Click here to download a PDF file, size 24 kb. Levantando interrogações sobre boa-fé de Maputo, Renamo critica discurso agressivo. Diário de Notícias [Lisbon] (11 April 1990). In Portuguese. Click here to download a PDF file, size 56 kb. Pronto para negociar. Diário de Lisboa [Lisbon] (12 April 1990). In Portuguese. Click here to download a PDF file, size 79 kb. Delegado da Renamo em Lisboa comenta discurso de Chissano. Século de Joanesburgo [Johannesburg] (16 April 1990). In Portuguese. Click here to download a PDF file, size 36 kb. Diálogo a curto prazo com a Renamo foi anunciado por Chissano em Lisboa. Século de Joanesburgo [Johannesburg] (16 April 1990). In Portuguese. Click here to download a PDF file, size 176 kb. Portugal disponível para ajudar mas não quer ser mediador oficial, refere Cavaco Silva depois de audiência com Chissano. Século de Joanesburgo [Johannesburg] (16 April 1990). In Portuguese. Click here to download a PDF file, size 252 kb. Reports that the Portuguese Prime Minister, Aníbal António Cavaco Silva (b.1939), told President Joaquim Chissano that Portugal was willing to help in the peace process but did not want to be nominated as an official mediator. Karl Maier. War-weary Maputo seeks fraternity with the enemy. Weekly Mail [Johannesburg] (20 April 1990-26 April 1990), p.17-18. In English. Click here to download a PDF file, size 111 kb. MNR wants talks in Nairobi. Herald [Harare] (21 April 1990). In English. Click here to download a PDF file, size 19 kb. Chissano in a hurry to end 13-year war. Citizen [Johannesburg] (2 May 1990). In English. Click here to download a PDF file, size 25 kb. Chissano on peace dialogue. Herald [Harare] (2 May 1990). In English. Click here to download a PDF file, size 19 kb. [News item]. Windhoek Advertiser [Windhoek] (2 May 1990). In English. Click here to download a PDF file, size 18 kb. Chissano is reported as saying that a choice of venue is the main obstacle to the beginning of talks, and the government does not want any intermediaries to be present. Chissano wants direct peace talks with MNR. Herald [Harare] (3 May 1990). In English. Click here to download a PDF file, size 45 kb. Segundo Chissano, Renamo propõe conversações em Portugal. Diário de Notícias [Lisbon] (3 May 1990). In Portuguese. Click here to download a PDF file, size 48 kb. Mozambique: no place for negotiations. Indian Ocean Newsletter [Paris] (5 May 1990). In English. Click here to download a PDF file, size 25 kb. Reports that Afonso Dhlakama is upset with the Portuguese government and that the location for talks is now a sticking point. Maputo dismisses MNR objection on mediator. Herald [Harare] (11 May 1990). In English. Click here to download a PDF file, size 31 kb. 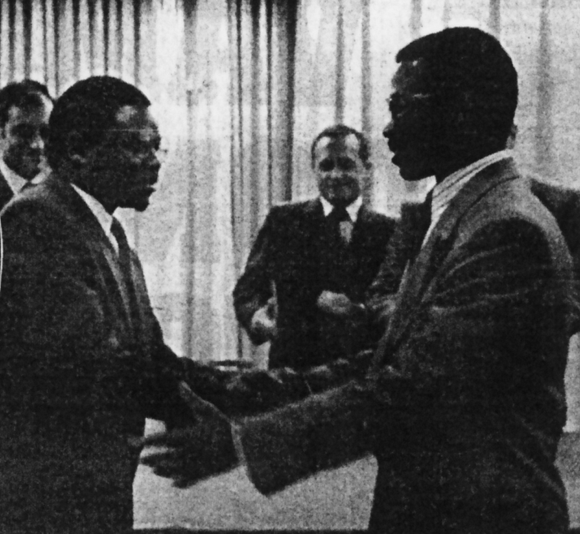 Above: Guilherme Simão Tamela, the press secretary of the Mozambican Embassy to Portugal (left), photographed shaking hands with Sebastião Temporário of Renamo (right) in a Lisbon hotel, mid-May 1990. Mozambican diplomat’s Lisbon meeting with MNR representative. Capital Radio broadcast of 15 May 1990 reprinted in the Summary of World Broadcasts [London]. In English. Click here to download a PDF file, size 16 kb. Frelimo não queria aperto de mão. Tal e Qual [Lisbon] (18 May 1990). In Portuguese. Click here to download a PDF file, size 437 kb. This page was first posted on 16 July 2013.